Out in the Dark Territories in former Skrull space, a starship has been attacked by Skaarn and its crew is in deadly danger. A hull breach erupts on the bridge and the ship's captain is pulled into space by the decompression! Suddenly, she finds herself safe inside a bubble of Nova Force. Nova is also containing the breach with the force bubble. He instructs the captain to get to a safe part of the ship. As she leaves, the captain is worried the spacecraft will burn up in the planet's atmosphere. Sam reassures her that he has a friend working on the problem. Beneath the ship, Beta Ray Bill has begun pushing the ship to a stable orbit. Nova joins him and their efforts bring the spacecraft to safety. As they depart, Bill asks Sam if he has any clues to where Skaarn may have gone. Nova mentions that the space pirate said he was headed "nowhere". The alien hero realizes where Skaarn is hiding. As the two enter a space warp, Sam asks Bill how he gained his powers. Beta Ray Bill offers a different story that he feels will be more beneficial to his new friend. Beta Ray Bill reveals that he is a member of a nomadic race after their world was conquered. Bill was bred by science to be his people's champion. He relates a tale of a day when their ship was attacked. Beta had no choice but to open the main airlock to remove the invaders. However, the hero was also sucked out of the ship! Bill reveals that another Nova, Richard Rider, rescued and returned him to the ship. Beta Ray Bill feels that, by helping Sam, he can return the help given to him by Rich. Suddenly, the two heroes reach their destination: Knowhere! Beta Ray Bill explains to Nova that Knowhere is the head of a deceased Celestial and is a neutral ground for many star-faring races. Bill's plan is to sneak aboard Knowhere and search for Skaarn. He tells Sam to stay outside in case Skaarn's ship eludes him. Inside the dead Celestial's head, Skaarn is attempting to acquire a destructive weapon called War Bringer. When the alien dealer laughs at the pirate's offer of slaves as payment, Skaarn pulls out a blaster and disintegrates him! Beta Ray Bill bursts into the room but stops when Skaarn communicates to his ship that Bill's people are to be killed if anything happens to him. 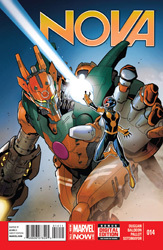 Suddenly, Nova unleashes a powerful energy blast causing the robot's hands to explode apart! Sam quickly grabs one of the cables hanging from the Celestial's head and wraps into around the robot's throat. The young hero sends the Nova Force through the cable and decapitates the War Bringer! 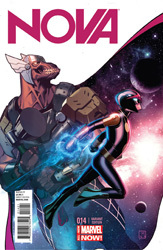 Nova meets up with Beta Ray Bill who explains the hostage situation. Sam Alexander tells his new friend that he has an idea. Later, the two heroes meet Skaarn at the Continuum Cortex. The space pirate reassures Beta that the Korbonites will be released safely as there is no profit in doing otherwise. Skaarn uses the Cortex to teleport the heroes to an unknown destination. However, in a darkened corner, Nova is using the Nova Force to create and manipulate an energy duplicate of himself. Skaarn believes the duplicate is the actual hero and teleports it instead of Sam! Skaarn leaves to go to Knowhere's armory and instructs his engineer to notify him when their guests arrives. Now alone, Sam tries to figure out the Continuum Cortex so he can bring Beta Ray Bill back. Suddenly, a telepathic message speaks in Nova's head. It tells him that Bill's trip was one-way but the telepath needs his help. Following the telepathic voice, Sam discovers Cosmo! The telepathic dog informs the Earth hero that he has been poisoned by Skaarn and they must take Knowhere back from the pirate!